The cream in these is more like a sibling of buttercream icing. I have halved the amount of filling that's in the middle so feel free to double the recipe for the cream filling if you would like too. I was just trying to keep them not so bad for you, they do have oatmeal in them after all. Now don't get all crazy on me for using a 1/2 egg again in this recipe. I do that sometimes because I can make smaller recipes that way. 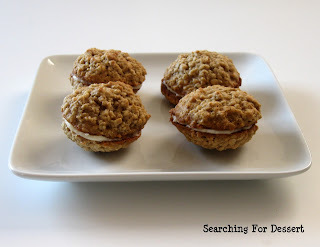 I actually made a 1/2 recipe of another cookie that used 1/2 an egg right after I made these. Then I could use the whole egg and not waste any. You could also use 1 1/2 tablespoons of liquid eggs if you prefer. I'm out of liquid eggs right now so I just plan to make two recipes that each use 1/2 an egg. To get an egg half you just crack the egg into a bowl, mix it up with a fork or mini whisk, and pour about half of the mixture into another small bowl. Always into another small bowl. If you are brave enough to pour half of the egg mixture straight into the batter it may end up accidentally taking the whole mix and that's no fun trying to get egg out of a pile of butter and sugar all mixed up. 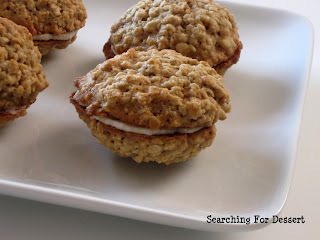 An option that might be fun is to toss in a tablespoon of cocoa (but take out a tablespoon of flour) and then you would have chocolate oatmeal cream pies...yum! I wish I would have thought of that while I was making these. 2. Beat butter and sugars at medium speed with an electric mixer until creamy. Add applesauce, egg and vanilla, beating well. 4. Bake at 375° for 10 minutes or until lightly browned around the edges. Cool on pan 2 to 3 minutes. Remove cookies from pan; cool on wire racks. 5. 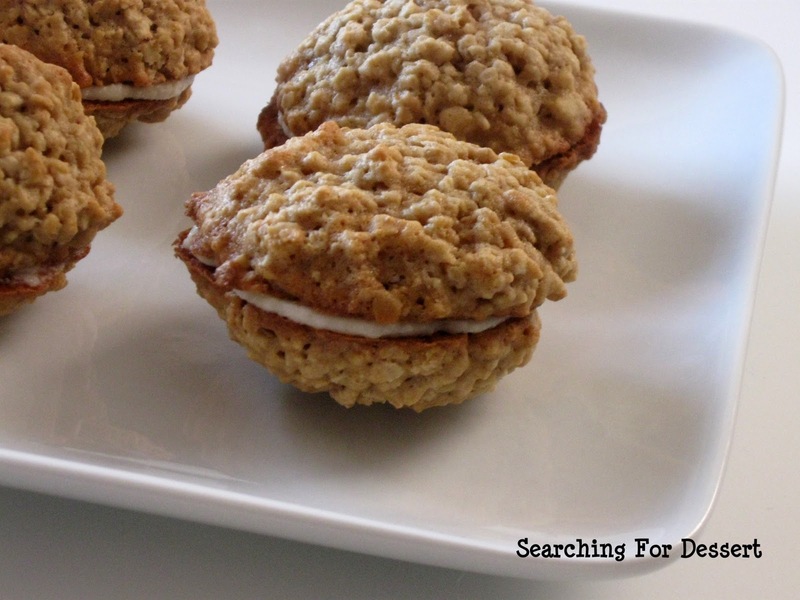 Spread ½ tablespoon Cream Filling over each bottom side of half of cookies; top with remaining cookies, right side up. 1. Combine all ingredients in a medium bowl. Beat with an electric mixer on low speed until combined, scraping bowl. Beat on high until light and fluffy.